The main cause of death in patients suffering from cystic fibrosis is respiratory infection caused by different bacterial populations, which vary according to the age of the patient. Scientists at the Institut Pasteur and Inserm have identified a novel mechanism used by the Pseudomonas aeruginosa bacterium to hijack the immune system of its host in order to eradicate another bacterium, Staphylococcus aureus (“golden staph”), and take its place in airways. These results were published in Nature Communications on October 7, 2014, and shed light on a phenomenon involved in the regulation of bacterial composition in the airways of patients suffering from cystic fibrosis. They could also have an impact on our understanding of how intestinal microbiota evolves. Cystic fibrosis is the most common serious hereditary genetic disease in the Caucasian population, and is due to a mutation of the CFTR (Cystic Fibrosis Transmembrane Conductance Regulator) chloride channel.This mutation leads to a fatal impairment of the respiratory system, which affects one in 2,500 births in Europe and North America. Life expectancy of patients is about 30 to 40 years. CFTR mutation leads to the abundant secretion of a thick mucus by airways in the lungs, which promotes bacterial infection. These infections are treated with antibiotics and, over time, this leads to bacterial multiresistance. Bacterial infections in airways are the main cause of patient death. In patients suffering from cystic fibrosis, bacterial populations in airways vary depending on the patient’s age. The team working under Lhousseine Touqui, a scientist in the Innate Host Defense and Inflammation Unit (Department of Infection and Epidemiology, Institut Pasteur / Inserm U874), looked at two bacteria commonly found in the airways of patients: a Gram positive bacterium, Staphylococcus aureus (“golden staph”), and a Gram negative bacterium, Pseudomonas aeruginosa. S. aureus is mainly present in the airways of young patients, and decreases with age until it becomes virtually absent at the end of life. P. aeruginosa, on the other hand, is practically absent in the airways of young patients, and then progressively increases over a lifetime, to be the most abundant bacterial type at the end of life. The scientists explained how this progressive shift of infection between the two bacteria takes place within patients’ airways over the course of a lifetime. The scientists first of all proved that the predominance of P. aeruginosa at the end of life was not due solely to antibiotic resistance, since S. aureus presents the same resistance and nevertheless progressively disappears. They then showed that a particular enzyme produced by the airways of cystic fibrosis patients is instrumental in the elimination of S. aureus by P. aeruginosa. The latter uses the airway’s immune system to kill the S. aureus bacterium. The Institut Pasteur and Inserm scientists have demonstrated the role played in this bacterial contest by an enzyme, type IIA phospholipase A2(sPLA2-IIA), whose ability to kill Gram positive bacteria such as S. aureus was already known. 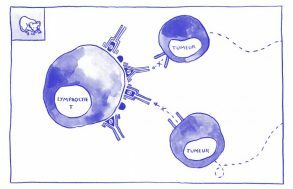 To date, sPLA2-IIA is known as the most powerful antimicrobial peptide produced by humans and able to kill S. aureus. 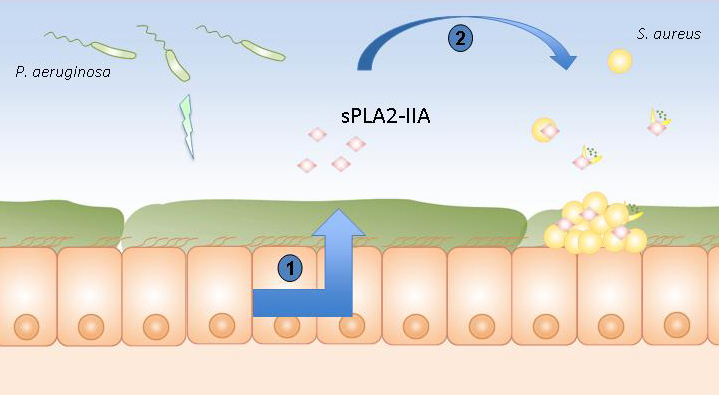 The scientists noticed that, in animal models, P. aeruginosa stimulates the production of sPLA2-IIA in airways, which is then released by host cells and kills S. aureus. In addition, it has emerged that sPLA2-IIA increases with patient age. This explains the fact that, with the appearance of P. aeruginosa at a certain age, secretion of sPLA2-IIA by the airways is triggered and kills S. aureus. It should also be noted that sPLA2-IIA is almost totally absent in the airways of healthy subjects. P. aeruginosa therefore manipulates its host in order to kill S. aureus, its bacterial competitor in the airways. Scientists have therefore been able to explain a sophisticated and previously unknown mechanism implemented by a bacterium to manipulate its host and kill a competing bacterium. This discovery suggests that sPLA2-IIA probably plays a similar role in intestinal microbiota dynamics, as these microbiota populations also vary according to host age. Lastly, looking beyond cystic fibrosis patients, sPLA2-IIA could be injected into patients infected with Gram positive bacteria, which could be a useful alternative therapy to overcome bacterial resistance to antibiotics. This study was supported by the French cystic fibrosis association Vaincre la Mucoviscidose, and the DIM Malinf research foundation (Greater Paris area). Stimulation of the production of sPLA2-IIA by Pseudomonas aeruginosa.